I am not cooking the meal this year, but am in charge of desserts. I have celiac disease, so cookies are difficult, but I can usually easily convert cakes to gluten free. Does anyone have any Christmas cakes they love? I'll probably do Bakewell tarts for Christmas (because yum they are so so good), but we'll also have a dinner on Christmas Eve. Family favorites? I've done Ocracoke fig cake before and loved it - there are little kids, so probably not an assertively spiced gingerbread. Well-equipped kitchen and good cooking skills, so difficult recipes are fine. Please suggest away! Other dessert options are fine as well...I have a post-holiday office party in January at lunch so need ideas for it, too. I know you're after cake tips, but I'm also a celiac and my cookie secret is to replace the flour with GF flour and then add xanthan gum. It's expensive, but you never need a lot, one tsp per batch is usually more than enough, and it has all the properties of gluten that GF cookies batters lack- stickyness, cohesion, fluffiness... no more crunchy puddles. These are the best peanut butter cookies I've had in my life and they happen to be vegan and gluten free. Hopefully peanuts are okay for the little kids. I make this cake. It's pretty easy to make if you have a good springform pan. I like to make mine with lots of lemon zest and then put berries and whipped cream with it. I've also used orange marmalade on top. But you can add different spices to it, it's pretty much a blank slate. Save the recipe and make it for Passover. The cake doesn't look like much, so I advise some sliced almonds or a handful of berries on top with a dusting of powdered sugar for decoration. Heck, I say embrace the ban on gluten and just pick a cake that doesn't use any flour in the first place. But I say this because flourless chocolate cakes are a thing. People who are not quite so fanatical about chocolate as I may disagree. fortunately there are other kinds of flourless cakes. This orange cake seems weird but is really great and is GF (as long as you use GF baking powder) - you need a springform pan, FYI. I serve it with this citrus cream. This is my go-to Christmas cake. I have made it probably 5-6 times and it is completely delicious and looks beautiful. This is the cake you want. It is designed from the start to be made without flour of any kind. It's light and rich at the same time, very chocolate and yet not too chocolate, and moist without any frosting. It looks impressive on a plate even though it's not that hard to make. The only powdered ingredient is cocoa. It's mainly composed of eggs (6, but I use 7-8 egg whites) and cream (1.5 cups) and cocoa (I always add extra, and leave out the coffee) and sugar (confectioners' and regular). It is also absolutely delicious and I'm pretty sure it's responsible for my relationship. I've cooked a lot of things, but when I want to impress people, I serve this. It's also pretty easy to make. I suggest practicing on one, since a) it can be easy to slightly scorch the roll part, and b) you'll be sad to share so much of the one you bring to share. Also: it's intensely chocolatey, and I've experienced a slight bit of caffeine reaction (i.e., wakefulness / cheerfulness), so be careful if that's an issue for you. Only downside: a little difficult to transport, but not impossible at all. If you're driving with another person, the easiest thing to do is assemble immediately before departure, cover it with a towel and hold it in the passenger's lap. If you're driving solo, you can pack it carefully and it will be fine (remember: no frosting to mess up). Gingerbread, which is really more like cake, is very Christmas-y. We made this peppermint-chocolate cake one year and it is AMAZING. You could sub in any favorite white and chocolate GF cake recipes that you know work well for you, and then add the peppermint flavor and marshmallow frosting. A shortcake part-baked then topped with whipped egg whites and mincemeat and cranberries (mincemeat as in English spiced dried fruit mix) is instant Christmas for me. Yes! I am obsessed with this fruitcake/Christmas cake which is really more fruit than cake and really more of a custard anyway. It does have flour in it, but I also cannot eat gluten and have successfully switched it out both last year and this using whatever flour I have laying around. This year I gave cakes out as my edible Christmas gift to friends and it went over really well. It does say that it should sit for a month in its brandy-soaked-cheesecloth cover, but that's not necessary; it's delicious right from the beginning. If you do want to make one for your January lunch you can totally have it sit and rebrush it with brandy every so often it would be ready right on time. I made the New York Times Sticky Cranberry Gingerbread by using Namaste GF flour in place of regular flour. It came out perfectly and it is quite delicious. 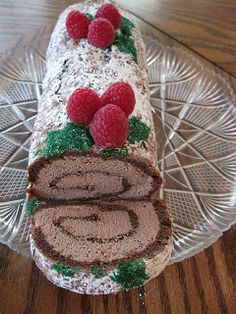 Chocolate roll is straightforward, nut-free and flour-free. It freezes well. Most kids love it. The Sri Lanka Christmas cake recipe from Charmaine Solomon’s Complete Asian Cookbook is amazing (and a lot of work and fairly expensive and makes a big cake). I’ve done it with ground almonds substituted for the semolina, and it comes out great. It’s just a dark fruitcake, but a very superior one. Definitely look into flourless tarts and tortes before trying to convert cake recipes to be GF. My personal favorite are flourless chocolate tortes which rely on eggs for volume and often ground almonds for structure. I like the recipes from a book called "Pure Chocolate". These "Ugly but Good" cookies are naturally gluten-free and my absolute favorite. I believe we do the Mary Berry Christmas cake. The BBC has a gluten free recipe as well. How about the traditional Australian christmas dessert - Pavlova . Only needs the gluten free version of cornflour. Looks pretty spectacular and is reasonably light (though very sweet). I came into suggest the orange cake that vunder linked. It is a thing of magic. I like it with fresh fruit and whipped cream. Some recipes recommend boiling a whole orange but some have you chop up the orange and simmer it gently with a little water. It takes less time. I do that.